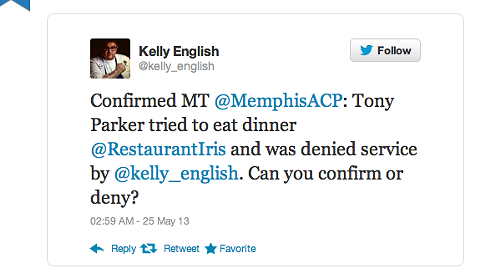 Spurs' Tony Parker Denied Service at Restaurant Iris? Did you see this Tweet from Friday night? A rep from the restaurant says a request was made for Parker for two tables at Restaurant Iris on Friday for Friday night. We all know that's not happening, right? The restaurant was already booked solid and generally is two weekends out. projectspurs.com: "Memphis Restaurant Denying Parker Service Still Comes Up Empty in Win Column"
restaurantiris.com: "regarding reservations at Restaurant Iris"